Last week we looked at playing the most common open position 7th chords. This week I will show you how to play 7th barre chords. There are a couple of advantages to learning 7th chords in the form of barre chords. 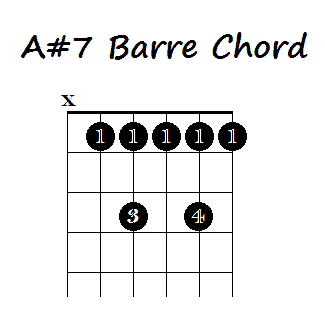 Why Learn Barre 7th Chords? Firstly, they are easy to change to from major and minor barre chords – and if you have learnt the major and minor barre chords already (which if you haven’t already it’s a good idea to do that first) then learning 7th chords as barre chords should be relatively easy. Secondly, learning them as barre chords gives you an option to play the 7th chords that you can’t play in an open position – for example and F#7. There are ways to play non-open 7th chords other than just using barre chords – but barre chords are the easiest way and a great way for a beginner to start incorporating these chords into their repertoire. If you haven’t already learnt how to play barre chords then please check out my post at the link below. This post assumes you have already learnt major and minor barre chords so won’t be going into detail about what barre chords are or how to play them. Instead I will be showing you some 7th chords that will build on your repertoire of barre chords. Also, this post is focused only on “dominant” 7ths (there are other less common versions of 7th chords) – for more on 7th chords and to learn what a dominant 7th chord is check out the link below. 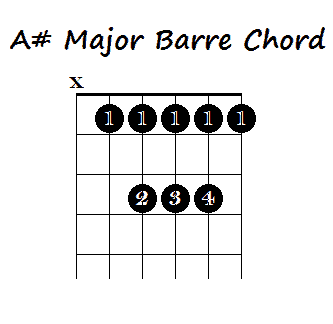 Like major and minor barre chords the barre 7th chords are based on the open E and open A. 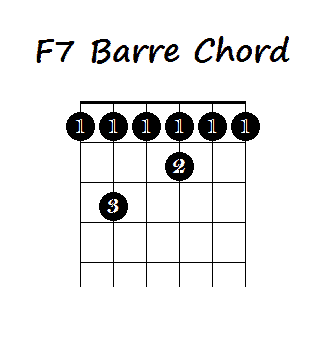 Only for 7th barre chords they are based on the open E7 and open A7. 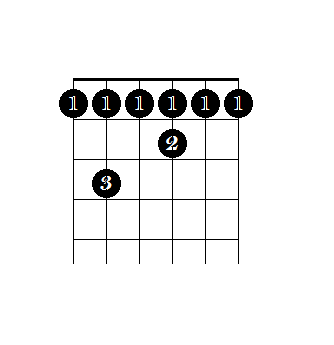 The 7th bar chords with the 6th string (Low E string) as the base note are based on the open E7 shape whilst the 7th bar chords with the 5th string (A string) as the base note are based on the A7 shape. 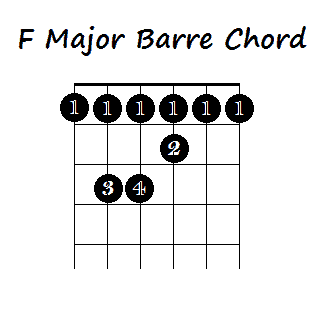 So let’s have a look first at the F major Barre chord. To make this chord into an F7 you simply need to lift off your 4th (pinky) finger. As you can see (if you’ve learnt your open 7th chords) your second and third fingers are in the shape of the open E7. 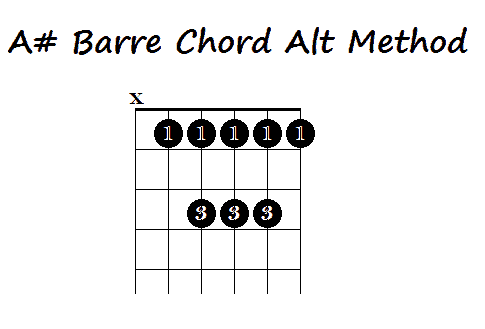 This, like all barre chords, can be moved up the fretboard to create whichever 7th chord you need. Now onto chords that have the base note on the 5th string. Then you can just lift up your 2nd finger and move your 3rd finger up one string to the 4th string (D string). The following is an A#7. Then just lift up the third finger so that it is only pressing on the 4th string (D string) and bring the 4th finger onto the 2nd string (B string) third fret. Either way I would definitely use your third and fourth fingers to make the shape rather than trying to leave your 2nd finger in place and lifting up the 3rd finger (I find that is an awkward way to play it). Note how the 3rd and fourth fingers are creating the same pattern as the open A7 chord. Now you can move this up the fretboard to create other 7th chords with the same pattern. So slide up one fret so that you are now barring the 2nd fret with your first finger and you will have a B7 chord. Practice these 7th chords and they’ll start to become second nature, like hopefully your major are minor chords are starting to become now. I hope this post has been helpful. If you have any questions or comments please feel free to leave them in the comments section below.